This Halloween, you’re gonna need a bigger tank to contain the fish in your house. 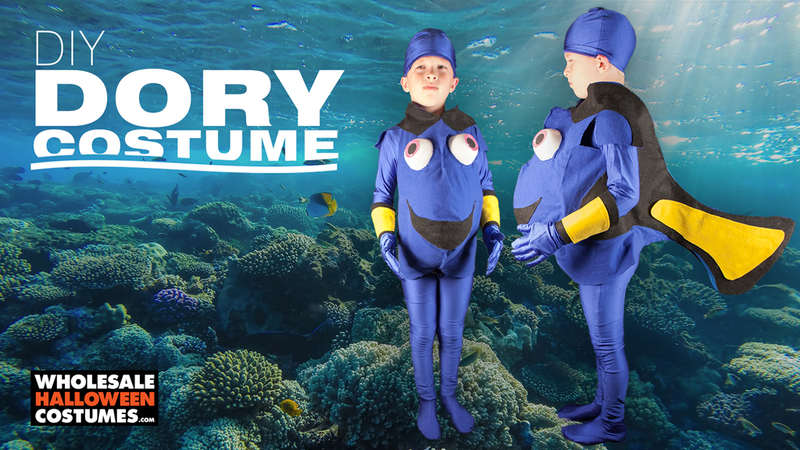 This DIY blue tang costume will have your kid swimming from house to house Finding Candy! Dory stole our hearts as the forgetful sidekick in Finding Nemo and earned herself her own feature film, Finding Dory. We all fell for her can-do attitude, and realized that determination and a little help from your friends is the secret to achieving goals. So if any of the trick-or-treaters in your house have #CandyGoals, then grab some friends and try to catch the current to the next house. Fear not, this outfit is no-sew. Follow along below, and if you get stuck, maybe Nemo could help you out. 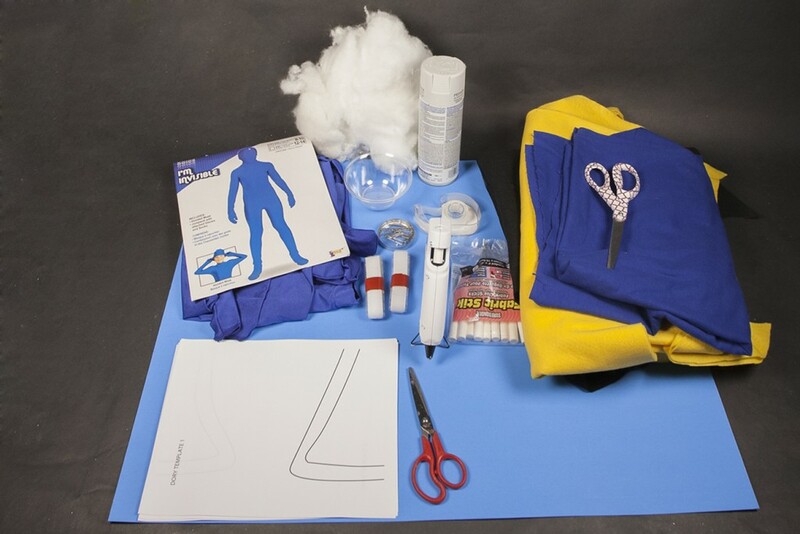 Our DIY Nemo costume is coming soon! Step 1. 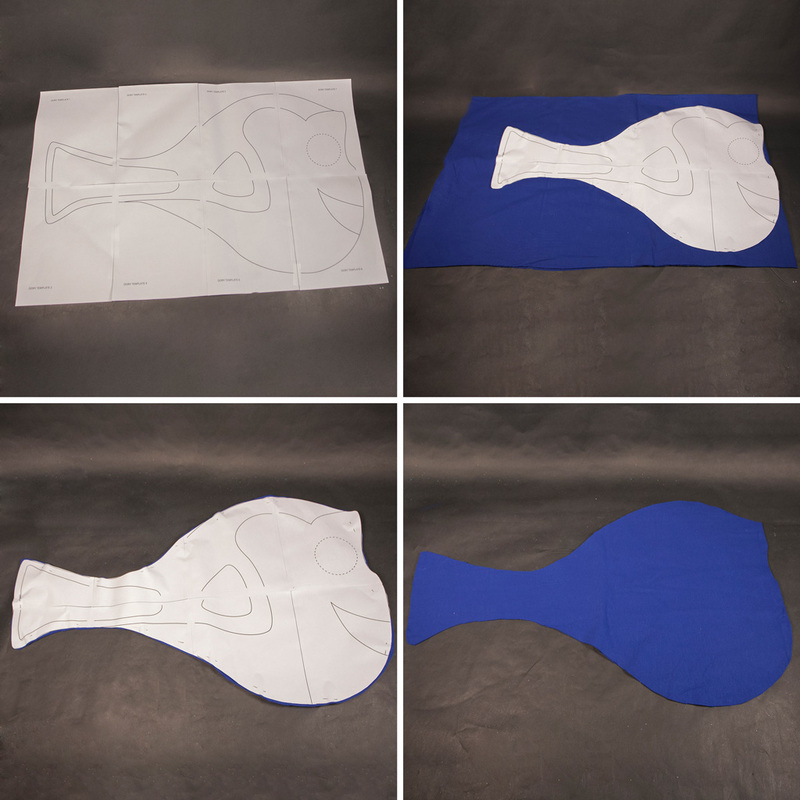 Tape the template pieces together as shown to create a giant picture of Dory. Cut out the template. Step 2. FOLD the blue felt in half, lengthwise. 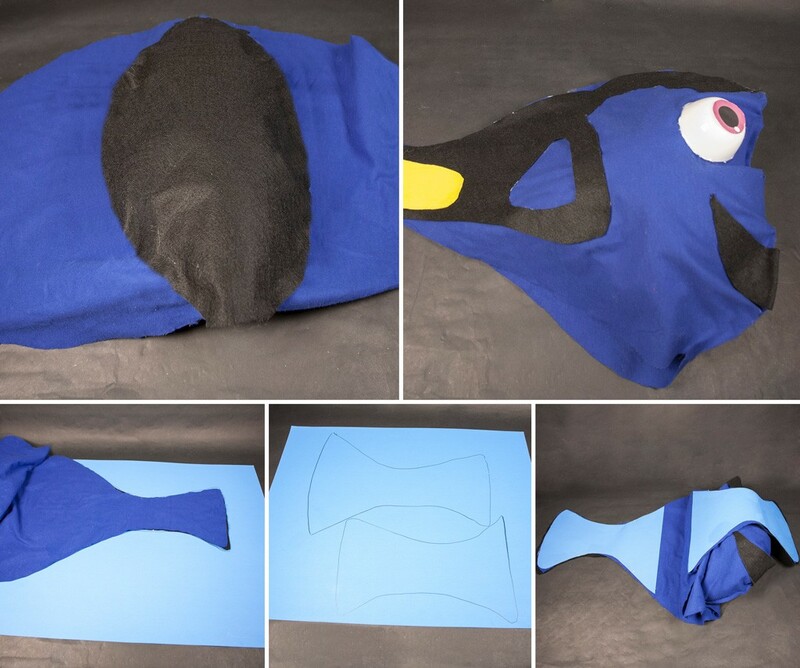 Pin the template to the fabric, approximately every 3-5 inches, with Dory’s mouth against the folded edge. Step 3. Using the fabric, cut the felt around the template. DO NOT cut the folded edge where it meets the template. Step 4. Remove the template. Your Dory should have two panels, attached at the mouth. Step 5. Unfold the fabric. Use the fabric glue to glue along the inside folded edge and approximately 4” in on the top and bottom, as shown. Fold back together. Step 6. Cut out the mouth and black detail from the paper template. FOLD the black felt in half. Pin the templates to the felt. The mouth template should be pinned against the fold. Step 7. Cut out the template. You should have two separate large pieces, and the mouth should be one piece, as shown. Step 8. 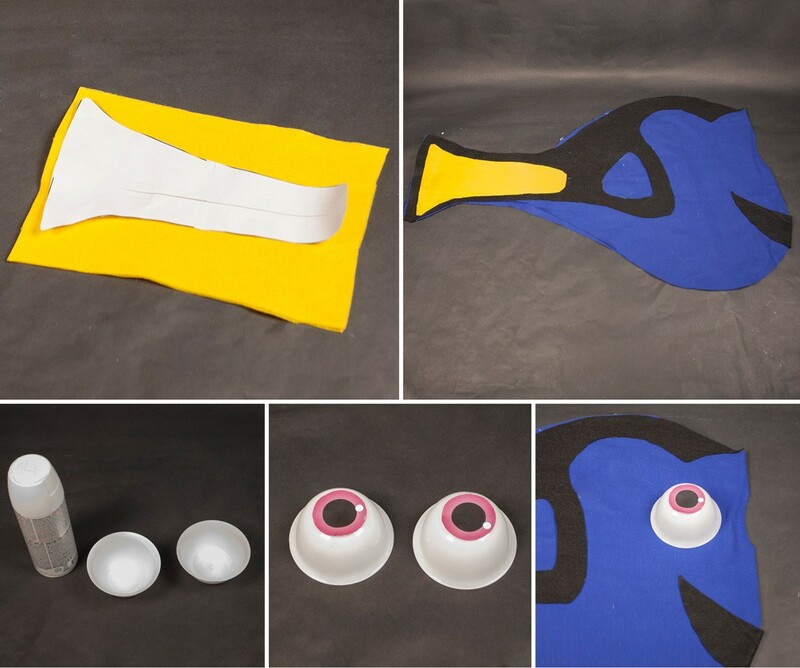 Glue the large black felt pieces to both sides of the dory costume. Step 9. Attach the mouth to the costume. It should wrap around both sides. Step 10. Cut out the template for the yellow fin from the larger template. FOLD the yellow felt in half. Trace on the yellow felt, and cut out. Step 11. 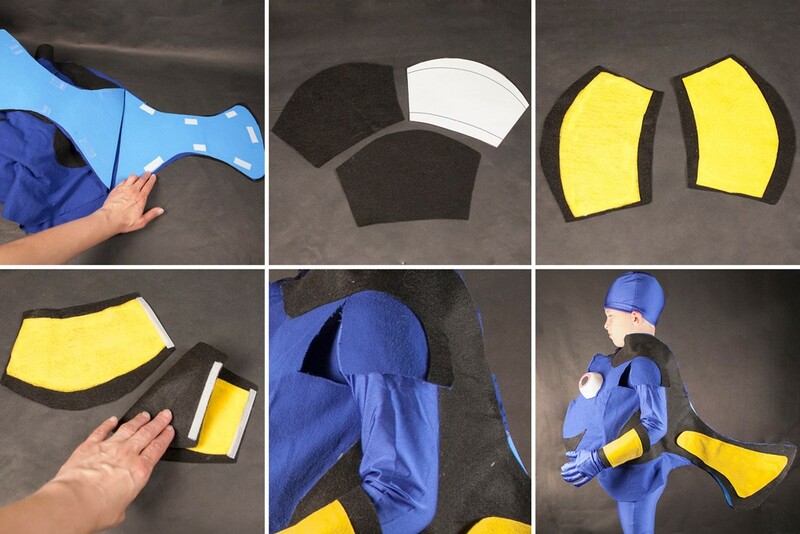 Glue the yellow felt to both sides of the costume. Step 12. If using small clear bowls, spray the insides of the bowls, white, let dry. If using white bowls, skip this step. Step 13. Cut out and glue the eye templates to the bottom of the bowls. Step 14. Place one eye on the costume, where it looks the best. Step 15. Make 4 marks around the outside edge of the eye. Remove the eye and draw a circle approximately 1/4” smaller than the marks. Step 16.Cut out the smaller circle, from both sides of the costume. Step 17. Place an eye through the hole, from the inside. Since the hole is smaller than the outside edge of the bowl, you should be able to glue the edges of the fabric to the rim of the bowl. Step 18. Repeat step 17 with the other eye. Step 19. Stuff the front of of the costume, so that Dory’s face puffs out. Step 20. 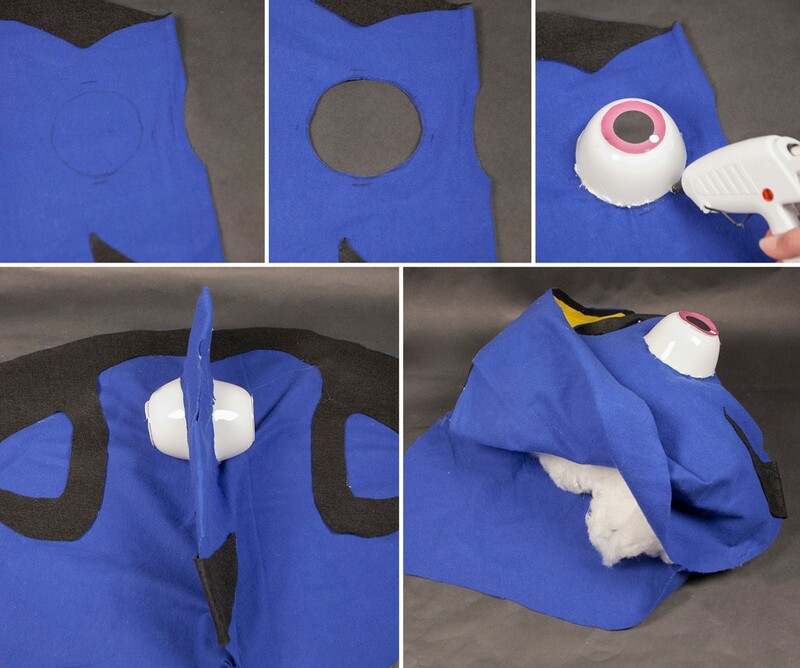 Once you have stuffed the front of your costume to your liking, open up the costume. Cut an oval piece of black felt large enough to cover the stuffing, it’s okay if the edges are rough, this part will be inside the costume. Glue the felt in place. Step 21. Now the from half of Dori should be nice and puffy. Step 22. Trace Dory’s tail on a piece of blue poster board. The poster board will help keep the tail more stable in a later step. Step 23. Trace the tail a second time and cut the pieces out. Step 24. Glue the both pieces to the inside of the tail. Step 25. Apply the adhesive hook and latch pieces to the tail. This will help to make the costume easy to put on and remove. Step 26. 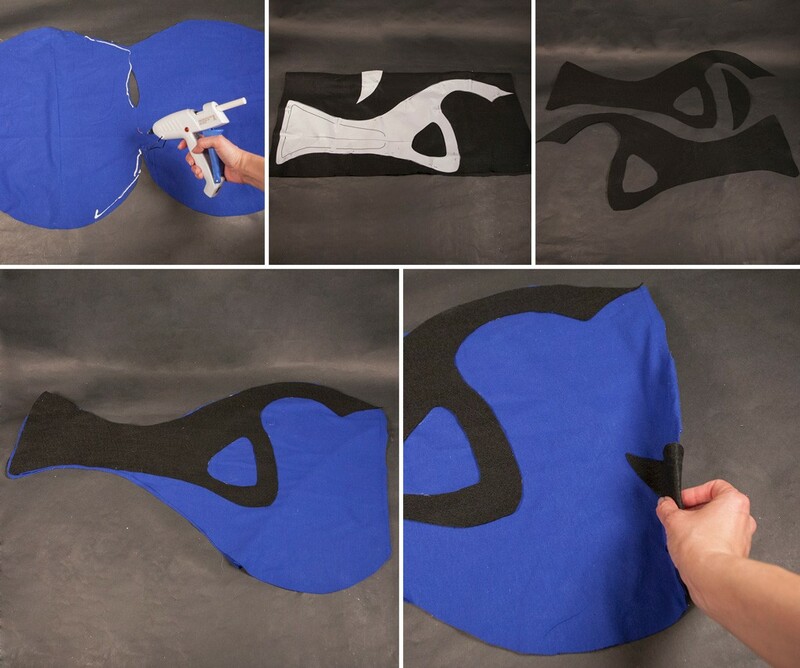 Trace the fin template on two piece of black felt and cut out. Step 27. Cut the fin template out on the inside lines and trace the fin on two pieces of yellow felt. Glue the yellow pieces onto the center of the black pieces. Step 28. Attach the adhesive hook and loop to the fins, so that they can be worn around the wrist. Step 29. To make the costume ready to wear, you will need to cut openings for the arm. The easiest way to do this is to have the person wearing the costume available. Mark where you think the arm holes should go. Cut the fabric to make a semi circle, keeping the top uncut, as shown in the photo. Step 30. The costume is complete. The person wearing the costume, can put the body on open, and then attach the 2 tail pieces together. Wear the blue body suit underneath, and the fins around the wrist to complete the look. 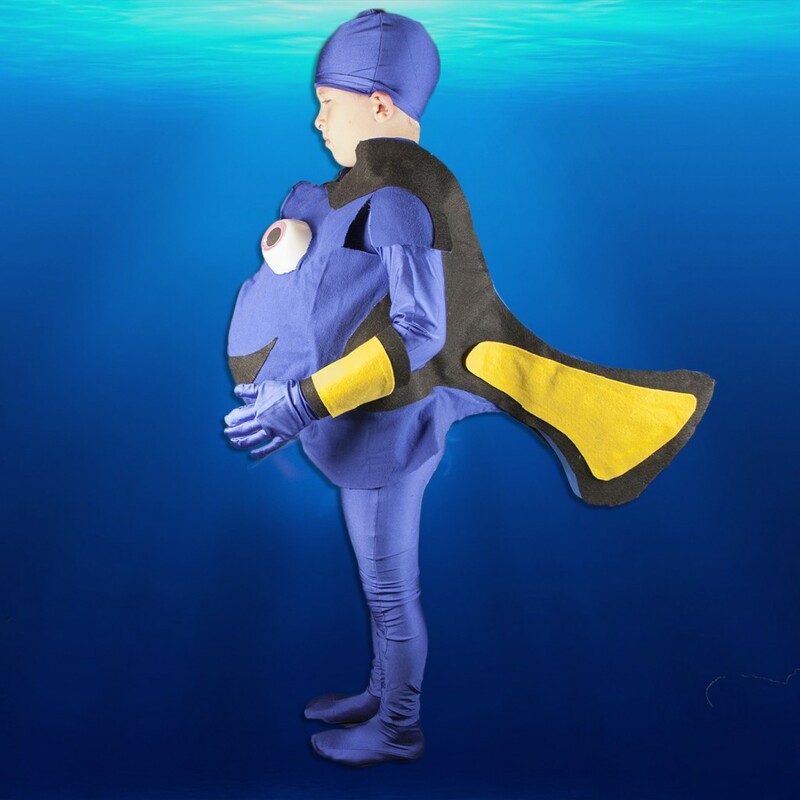 Now all your little fish needs to do is “just keep swimming” from house to house filling up their Trick-or-Treating buckets and bags! Share pics with us on Facebook, Twitter or Instagram using #WHCostumes!